FILE - A rubber boat with 129 migrants on board, among them 60 women, is seen sailing out of control about 15 miles north of Al Khums, Libya, Aug. 1, 2017. Italy is being accused of paying off Libyan militias linked to people smugglers in order to stop trafficking migrants across the Mediterranean for a month. 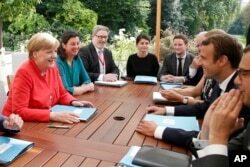 The claim, which coincides with an 86 percent fall in the number of asylum-seekers reaching Italy this month, compared to August of last year, comes as European and African leaders met in Paris to discuss how to stem the migrant flow roiling Europe. FILE - Migrants sit at the Tajoura branch of the Anti-Illegal Immigration Authority, in Tajoura, Libya, Aug. 6, 2017. According to Middle East Eye, a London-based news site, the Italian government has been paying off local brigades in the city of Sabratha, 80 kilometers west of the Libyan capital, Tripoli. The alleged payoffs involve cash, aid and equipment, and are channeled through the city’s municipal authorities, which are controlled by the militias, the site claims. Earlier this month, the Italian Development Cooperation Agency announced it shipped 11 tons of aid to Sabratha University Hospital. Italian government spokespersons are refusing to respond to the payoff allegations, but last week the Reuters news agency reported an armed group has been stopping migrant boats from setting off across the Mediterranean from Sabratha beaches. There have also been reports that trafficking from nearby Zawiya has come to a virtual standstill. The trafficking trade may have been disrupted, too, by the arrest in recent days of Fahmi Salim Musa Bin Khalifa, nicknamed the “king of smuggling,” by a mainly Islamist militia, known as the Rada Special Deterrence Force, in Tripoli. A Rada statement said, “He is considered to be one of the biggest smugglers across the [Mediterranean] Sea, and owns transporters. He is also very active in sending death boats [migrant boats] across the [Libyan] shores of Zuwara and Sabratha.” Zuwara is a port city in northwestern Libya, 60 kilometers from the Tunisian border. In explaining the sharp drop in numbers during July and August, Italian authorities say weather conditions have been highly changeable in what is normally peak season for crossings, but the weather has been highly favorable, according to seafarers. Another explanation offered has been the Libyan coast guards have been more effective in their interdiction efforts, because of training and equipment offered by the Italian navy. An Italian warship is docked at Tripoli’s port. 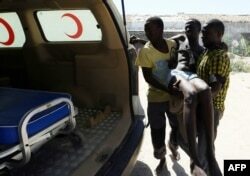 FILE - An illegal migrant is carried to an ambulance after he was rescued by the Libyan coast guard when the boat he was on sank off the coastal town of Garabulli, 60 kilometers east of Tripoli, Sept. 15, 2014. According to analysts, some coast guard units are also tied to the militias. On Saturday, Italian Interior Minister Marco Minniti met mayors from southern Libya to renew a commitment to fight people trafficking as part of an agreement signed earlier this year between Rome and the internationally recognized government of Fayez al-Sarraj, who heads one of Libya's three rival governments. The meeting focused on helping to shape economic alternatives to human trafficking and contraband smuggling in Libyan towns that profit from the migrant trade. “Youngsters in those areas and the whole of Libya deserve a future of hope, free from the threats of criminal organizations,” Italy’s Interior Ministry said in a joint statement with the Libyans. “Libya looks forward to the timely support of Italy and the European Union," the statement continued. Since 2014, more than 600,000 migrants have reached Italy by sea from Libya, where people smugglers linked to dozens of mainly town-based militias have operated with impunity in the turmoil that has engulfed the country since the fall of Moammar Gadhafi in 2011. Italy's coalition government of Paolo Gentiloni has been stepping up efforts to curb the migrant influx. Last month, Italian authorities introduced a code of conduct for NGOs operating humanitarian migrant rescue vessels in the Mediterranean. FILE - Migrants sit on the deck of the vessel of Proactiva Open Arms after being rescued in the Mediterranean Sea, about 15 miles north of Sabratha, Libya on July 25, 2017. The charities were accused of at best acting as a “pull factor,” encouraging asylum-seekers to risk the perilous crossing and, at worst, actually coordinating with the people smugglers and facilitating the trafficking. Five of eight aid groups that operate migrant rescue ships, which pick up about 40 percent of the migrants rescued in the Mediterranean, have refused to sign up to the code, which discourages them from patrolling in Libyan territorial waters. At the meeting Monday in Paris, Italy was to push the European Union to try to replicate with Libya a deal struck last year with Turkey that largely shut down the migrant route through the Balkans. Analysts warn such a deal would be unworkable when it comes to Libya, given its lack of an effective central authority. The Italians, with German support, have been pushing for a concerted interdiction effort along Libya’s southern borders. 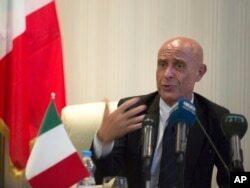 Minniti also met Monday with the interior ministers of Chad, Libya, Mali and Niger to discuss strengthening controls on sea and land borders. Rome wants the U.N. refugee agency and the International Organization for Migration involved in setting up migrant centers in Niger and Chad. Meanwhile, with full migrant centers, Italian authorities are considering using property confiscated from the mafia to house asylum-seekers.